This season’s Champions League has thrown up numerous surprises. The most obvious being the absence of any English team from the quarter-final draw, for the first time since the 1995-1996 season. Aside from this, the presence of Borussia Dortmund in the last 8, didn’t shock too many, but their road to the quarters couldn’t have been more difficult. What’s more astounding about the rapid rise of Dortmund is that only 5 years ago, the possibility of the German club competing for major European honours seemed a fairytale. Borussia Dortmund is another football club steeped in History. It may not be as decorated as its German counterparts Bayern Munich but it is interesting to look at nonetheless. Like with other German clubs, the club’s past is best to begin viewing after World War II. Prior to the Second World War, Dortmund had been a moderately small club founded in 1909 by 17 youths unhappy with the “trinity youth” where any sport was overlooked by a strict parish priest. After WWII the original Borussia (Lat. 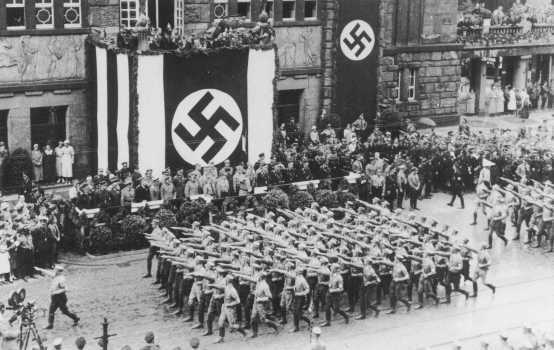 Prussia) Dortmund were dissolved like any other German organization by the Allies to distance the club with its Nazi past. However, before the War, Dortmund’s president was sacked due to his anti-Nazi tendencies. “BvB” was re-established in 1948 after the original dissolution by the Allies. They would go on to reach the German Cup Final the following year, before dominating West German football for the next decade. In 1962 the Bundesliga was officially formed, the 2012-13 season being its 50th. The club’s record in the 70s and 80s was that of a mid-table team after financial difficulties, not claiming a league title or cup until 1989 (The German SuperCup). The 70s and 80s of course remembered by Germans as the Bayern years, as Beckenbauer, Muller and Maier spearheaded the Munich revival. Dortmund’s recent history can be characterised in five words, “Rise, Fall and Rise again”. 1991 was the original turning point for the club as Otmar Hitzfeld took over the reins as Borussia’s manager. After narrowly avoiding the drop in 1986, Dortmund managed a second place finish by 1992 in Hitzfeld's first full season. To the Dortmund fans the mid 90s are often referred to as the "Golden Age". Consecutive league titles in 1995 and 1996 prompted the appearance of BVB in the greatest club competition of all, The Champions League." The 1996-97 season supplying the setting for arguably the greatest victory in their History. RISE: The previous season's European Cup had been won by Juventus on penalties against holders Ajax after a 1-1 draw. It would be the side from Turin who would face BVB in the final, to be played at old rivals Bayern Munich's Olympiastadion. The road to Munich had been comfortable for Dortmund, with only one defeat in the group stages to Atletico Madrid, before beating a strong Manchester United 2-0 over two legs in the semi finals. Borussia's team consisting of the likes of Mathias Sammer, Andreas Moller and Lars Ricken would prove too strong in the final for Juve by securing a 3-1 victory. This wasn't just any Juventus team as well. Their side supplying the enviable talents of Alessandro Del Piero, Christian Vieri and the young Zinedine Zidane. This surely meaning that the 1997 victory has to go down as one of the best in modern years. FALL: The beginning of the 21st Century proved a turning point for Dortmund after financial problems hampered a promising start. Despite the loss of Hitzfeld to Bayern Munich in 1997, Borussia managed to win the Bundesliga in 2002 and reach the UEFA Cup final (losing 3-2 to Feyenoord). However, as in the 1970s and 80s the club was crippled by financial problems due to a decline in the stock market (Dortmund being the only club to be publicly traded), needing a £2 million loan from Bayern to cover their payroll. The following seasons brought more mid-table mediocrity before even coming close to relegation in 2006/7 and 2007/8. They would need an urgent change. The answer? Jurgen Klopp. RISE AGAIN: Klopp's arrival in 2008 would spearhead the rapid change to Borussia's fortunes. Klopp's early record was decent, resulting in a 5th place finish in 2010 before the 2010-11 season which brought BVB back into the international spotlight. Dortmund's youthful squad winning the league title despite an average age of just over 24 with the talents of Nuri Sahin (21), Mario Gotze (18) and Mats Hummels (21) leading the campaign. The season also including a run of 14 wins out of 15 before Christmas. Despite losing Sahin to Madrid the following season, BVB still managed to win the league and cup double. The latter being secured by a 5-2 victory over Munich with Polish striker Robert Lewandowski scoring a hat-trick. This season has brought young attacker Marco Reus to the Westfalenstadion, forging a partnership with Mario Gotze described by Franz Beckenbauer as a "classic duo, there is no one more prolific than Gotze and Reus". Nevertheless the club has fallen behind Munich domestically, effectively conceding the Bundesliga already and being knocked out by the Bavarian club in the German Cup. However, the Champions League could prove to be the light at the end of the tunnel and possibly the perfect send off for Jurgen Klopp as speculation continues to rage on over his future. Surely the prospect of the Dortmund v Munich derby next season with Pep Guardiola should be enough for Klopp to take on one more season and show us all who really is the top dog in Germany! Bayern's new boss, surely a reason for Klopp to stay?